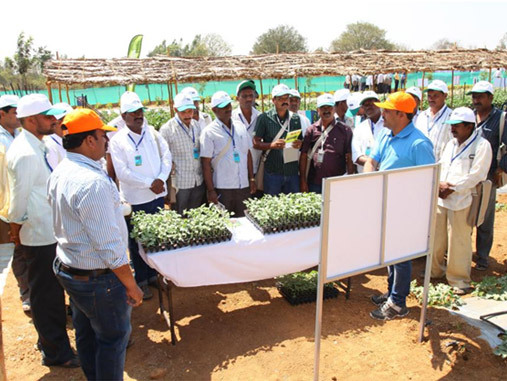 Syngenta recognizes that the India’s farmers need more tailored, integrated solutions to make agriculture an economically viable and rewarding way of life. In 2011 we moved away from a single product paradigm and developed fully integrated offers for key crops by bringing together our crop protection, seed care and seed portfolios. Building on the combined strength of our businesses, the company is embracing the farmer with one voice and one face, to deliver end-to-end integrated solutions on a global crop basis. 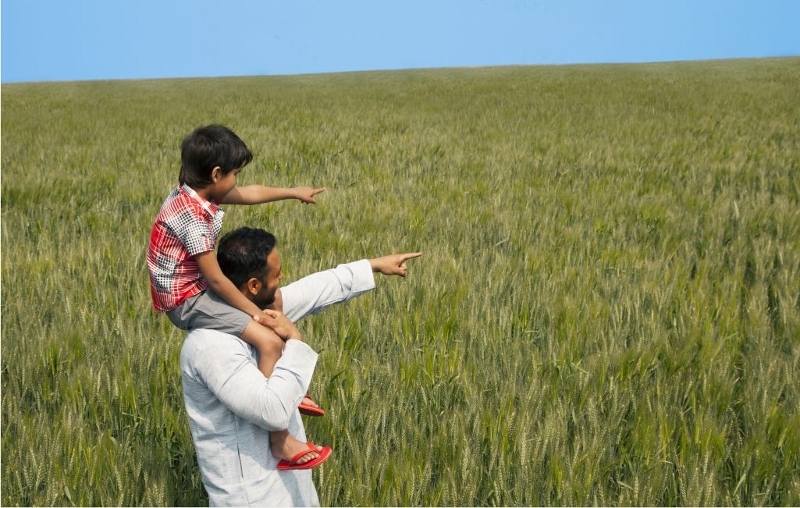 Syngenta offers integrated solutions for key crops like corn, wheat, rice, vegetables, specialty, diverse field crops, soya bean and sugarcane. Our ambition is to bring greater food security in an environmentally sustainable way to an increasingly populous world by creating a worldwide step-change in farm productivity. Our ambition encompasses the 8 million large farms worldwide with over 100 hectares as well as the 450 million small farms with 2 hectares or less. 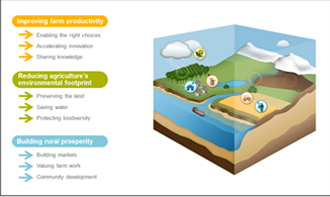 Syngenta has unrivaled portfolio breadth spanning crop protection, seeds, seed treatment and traits. Our aim is to develop offers that meet differing market requirements and have demonstrable beneﬁts in the ﬁeld. Environmental, societal and value chain developments have given rise to a plethora of choices and decisions for the farmer. With our expertise, we can help make growing crops simpler and more productive. The beneﬁts of the integrated strategy have been most pronounced in the emerging markets, which are driven by intensiﬁcation and technology adoption. We have identiﬁed the key strategy success factors in these markets and will seek to replicate them more broadly. Importantly, we will build upon a number of new product launches to reinforce our customer relationships and to expand the scope of our integrated solutions. We maintain a clear focus on bringing strong new products to market. Each of these products offers multiple opportunities for combinations with the existing portfolio and for the creation of integrated solutions. Every day, our customers are measuring the performance of our products in the ﬁeld. 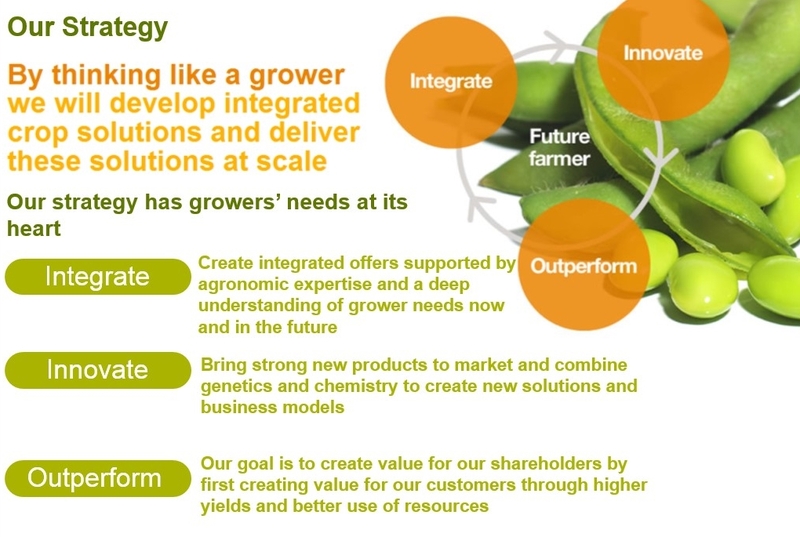 In order to achieve our objective of market share gain, we need consistently to demonstrate the beneﬁts of our portfolio not only to growers, but also to other participants in the value chain. We also need to sustain the ﬂow of innovation and to design new offers that can be delivered at scale. Our crop-focused approach is now deeply embedded in the company and recognized by our customers. By thinking like a grower, we are better able to meet evolving needs worldwide. In emerging markets we are enabling technology adoption, while in developed countries we are helping growers to deal with problems such as weed and insect resistance, as well as an increasingly demanding value chain. As awareness of the need to preserve ﬁnite natural resources grows, we are developing solutions that can help to ensure the sustainability of agriculture. Seeds that improve yields with early emergence, vigorous growth & quality input. Crop protection products that protect yields by controlling insects, weeds and diseases.